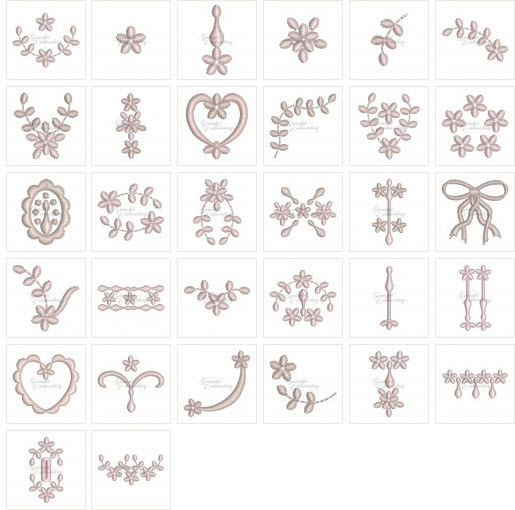 I have been asked numerous times to create small designs for some of my heirloom collections that can be used for doll’s and tiny baby clothes. 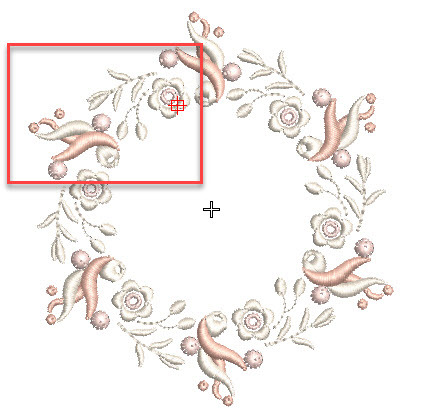 With a little editing in your embroidery software these can also be combined to create unique curved collar accents, borders, panels and inserts, perfect for an important embroidery project. 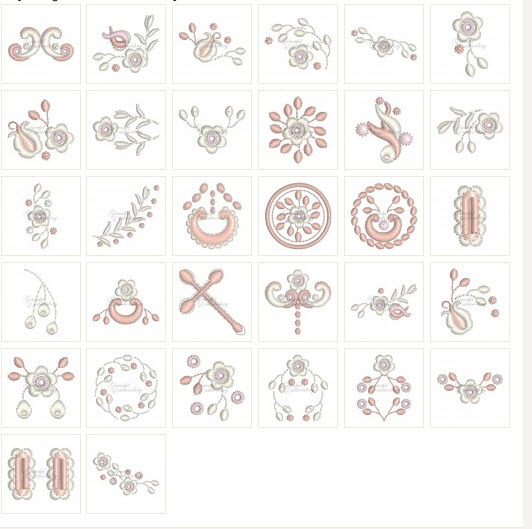 I am going to play with some of these designs in my embroidery software, to show you a little of what you can produce with them. This is a combination of design #1 with design #2 placed each side. It makes a nice border for around a sleeve. As you can see I have created design #3 so it can be placed tightly in a row. Now design #4 will not sit in a row but it works in a diagonal if each alternate design is vertically flipped. 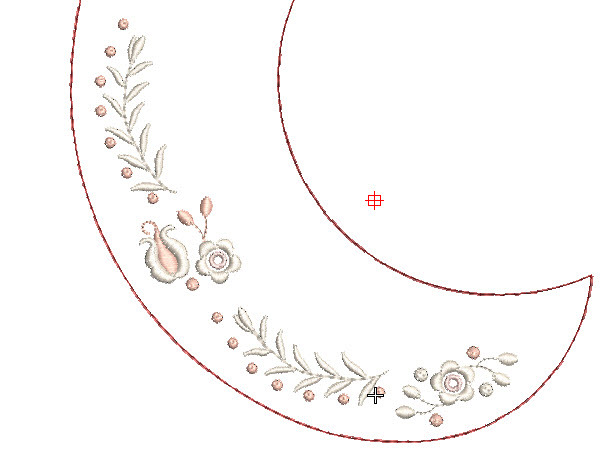 Having drawn a collar shape in my software I combined designs #5, 6 and 23 to see how they looked. This was my second attempt using designs #7, 13 and 14. The curve of the leaves fits wonderfully with the curve of a collar. If you have the “encore” feature in your software open design #11 and 12 and create a wreath with them as I have done here. 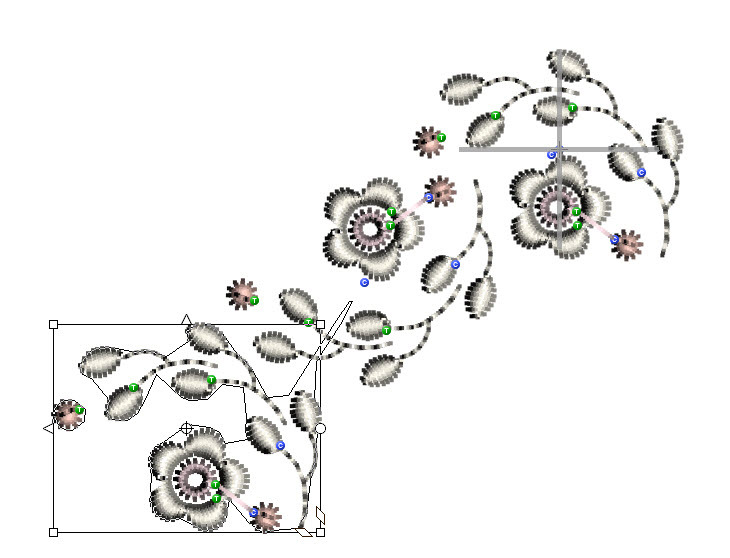 How you position the 2 designs and the number of repeats will effect the end result. I have highlighted how I positioned them and I choose to merge six of them. Every time you use this feature the results are slightly different. 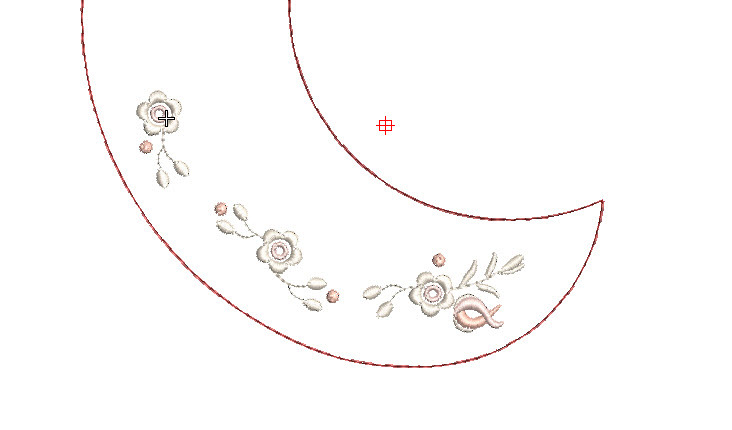 I love the buttonholes in this collection and I have paired design #21 with the scallop design #15. Do cut the button holes and thread ribbon through. Taking design #27 I have created a little panel of designs which could be used as an insert. I hope this gives you an idea of how you can use these designs. The possibilities are endless. Have fun! By the way a while back I produced Georgiana 6 my first set of designs for 1.6″ square hoops so they can be used in similar way. More will follow if you ask for them. Une Petit Princesse 6 is has been released today, 11th June 2017. This entry was posted in Discussing machine embroidery, Embroidery projects, New Designs and tagged combining embroidery designs, development of embroidery, editing designs, heirloom embroidery, machine embroidery. Bookmark the permalink. The Une Petite Princesse 6 set is beautiful! I sew American Girl 18″ doll clothes & these will certainly add to their appearance. I can see different designs of this set gracefully set on Peter Pan collar blouses & many other uses (border trims etc.) Heading over to check this out! Have a fabulous week ahead! Thanks for sharing your awesome talents. That sounds perfect. I hope you will show me some photos when you have created some embroidered clothes.